Figuring Out Clay Body Plasticity Can Help You Succeed In the Studio! Ahhh plasticity! It’s the property of clay that got us hooked on it in the first place. Caused by just the right mixture of water and particle size, plasticity is what transforms dry cracky clay (like in the image above) into a workable clay body. Plasticity separates clay from dirt. In today’s post, we learn all about this magical characteristic. – Jennifer Poellot Harnetty, editor. What is it about clay that lets us shape it, pinch it between our fingers, roll coils, throw pots on a wheel, extrude endless shapes, and stretch it in every direction – all while the clay, hopefully, stays in one piece? We call this property of clay plasticity, and it takes a plastic clay to perform any of these forming processes. The very fine particle size of clay plus a liquid (in our case water and the chemistry of that water) control the plastic properties of any given clay body. Plasticity: The property of clay that allows it to change shape without rupturing when force is applied to it. Plasticity of potter’s clay cannot be measured by any scientifically repeatable test. Therefore its measurement is subjective. Workability: The character of a clay that is a combination of plasticity and wet strength. The addition of grog or sand may permit a plastic clay to stand up taller without slumping, thus making it more workable even though it is not more plastic. Short: Clays and clay bodies lacking plasticity. A coil rolled or extruded from a short clay, when bent sharply or tied in a knot, will show signs of tearing and cracking. Particle Packing: A percent, always less than one hundred, representing the volume fraction of solids in a given volume of a material. Flocculation: The process very small particles like clay exhibit in forming loose clumps due to weak electrostatic attraction between the particles. These clumps are called flocs or agglomerates. Without some water, clay is just a powder. While that seems obvious, the role of water in the plasticity of clay has not been clearly understood. Without going into the complex theories scientists have used to explain this, it is apparent that clay needs the right amount of water to become plastic. This is usually on the order of 20% water by weight. Clay particles are attracted to each other by weak electrostatic forces. Water conducts these forces. Thus, dry clay mixed with a fifth of its weight in water, becomes the plastic material clay artists use. Water also can be thought of as a lubricant that permits clay particles to slip past each other without breaking away from each other. Clay particle size has the greatest influence on plasticity of clay bodies. Clay particles are ordinarily about 1 micron (one millionth of a meter or one thousandth of a millimeter) in size. Such tiny particles have a lot of surface for their weight. All of the particles in one gram of kaolin, for example, typically have a combined surface area of 20 square meters! For comparison, the non-plastics in a clay body, such as feldspar and silica, are usually about 40 microns in diameter and have a surface area of 1 square meter per gram. Recent research at Alfred University has demonstrated that efficient packing of the clay particles in a body dramatically improves plasticity of the body. It is thought the improvement is due to more electrostatic attraction between particles that are packed more closely together. Packing efficiency can be controlled by blending clay body ingredients by particle size. Stoneware clay bodies, without grog, typically have a packing efficiency of about 62%. Porcelains frequently are packed as poorly as 56%. Tile bodies used in industry, packed as high as 72%, become too stiff for hand use. An ideal packing efficiency is found in grogged stoneware and is about 68%. This is the gold standard for clay plasticity because this results in as little space between clay particles as possible while still allowing easy movement against one another. Further research at Alfred University shows that the amount of water necessary for plasticity is related to the packing efficiency of a given body – the higher the packing efficiency, the less water necessary for plasticity. This helps explain why the amount of water for plasticity is not the same for every body. The pH (whether acid or base) of the water in a clay body affects its plasticity. Very mild acidity (a pH of 6.5‚ – typical pH of drinking water) is ideal for clay plasticity. Keep in mind that potable water (i.e., drinking water) may contain additives that suppress bacterial growth, thus reducing the contribution of naturally occurring organic matter on the aging of clays. Clay artists tend to think of aging clay as a process of improving the clay’s plasticity by storing it for a long time. 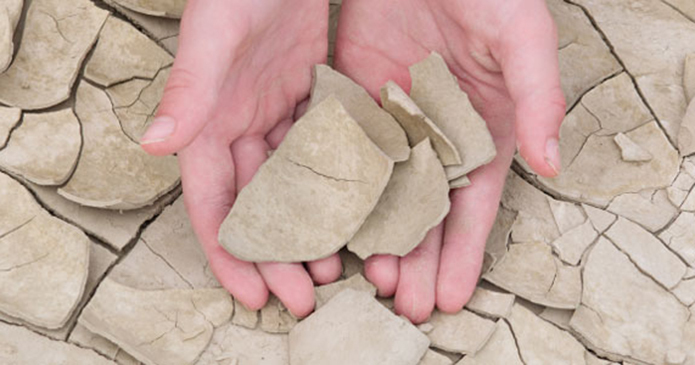 Clay that is mixed with a minimum amount of water (so called dry mixed) behaves this way and exhibits increasing plasticity for the first two to four weeks of storage as it becomes fully wetted. Clay mixed in a significant excess of water (slurry mixed) ages much faster. Slurry mixed clay appears to achieve full plasticity within three days of being mixed, because it is thought that the clay is wetted more efficiently by the excess water used in the process. Commercially manufactured organic materials claim to improve plasticity but, in general, testing has not proven the cost of these materials is justified by any significant improvement in plasticity. There is also potter folklore about organic materials added to clay bodies to make them more plastic. These materials have included milk, beer, urine, and vinegar, among others. There is no objective evidence that any of these additives, by themselves, actually improve clay plasticity. It is likely that bacteria in the clay feed on these organic additives and give off wastes that lower the pH of the water in the clay body. This can and does improve the clay’s plasticity, but has the unfortunate side effect of developing unpleasant odors, and some additives can promote the growth of unhealthy bacteria and/or molds. Finally, consider that boxed clays are mixed and crated days, weeks, even months before use. Further aging in the studio is likely not necessary, as the aging process continues in the clay until completed – a process that typically takes only a few days. acid, additives, artists, base, body, breaking, chemistry, clay, clay artists, clay bodies, clay body, clay plasticity, coils, completed, dry, earthenware, excess, feldspar, flocs, folklore, grog, growth, image, improvement, in the studio, included, influence, ingredients, kaolin, learn, materials, molds, particle size, plasticity, plasticity of clay, pots, potter, process, research, results, sand, shape, short, short clay, silica, size, slip, slumping, stoneware, stoneware clay, storage, studio, surface, taller, testing, throw, tile, time, water. this gives me a very good great idea.thank u so much.